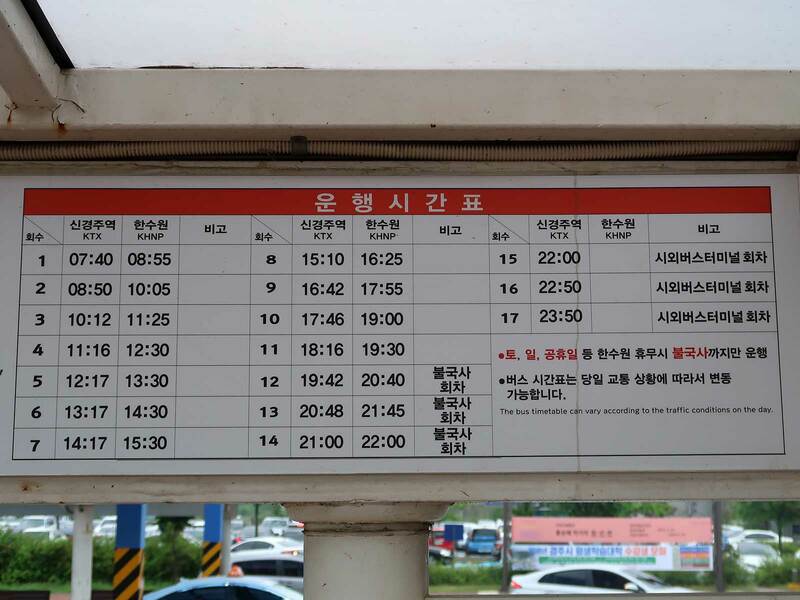 Long distance trains in Korea can be booked online up to a month in advance, and popular services often sell out well ahead of time. By the time I’d finalised my plan for today the only direct trains available from Seoul to Singyeongju were before 7:00am, not something I wanted to deal with after a long week of business meetings. I decided instead to book a connecting route that would allow time for a lie-in and a relaxed breakfast in my hotel. This option meant that I wouldn’t get to Gyeongju World before about 1:00pm, but I didn’t expect that to be a problem given that the place was open until 8:30pm. By Thursday however it was evident that the weather gods were going to throw a wrench in my carefully laid plans. The forecast for the entire Korean peninsula was grim, with heavy rain gradually spreading south-east over the course of the weekend. 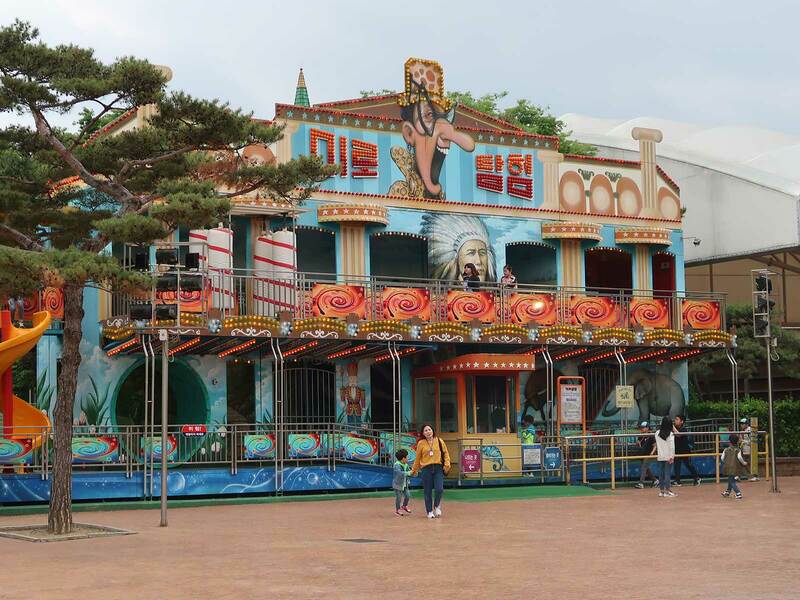 I’d have been completely snookered if I'd planned to go to a park on the west coast or the alpine coasters in the north-east, but the area around Gyeongju was showing as dry until noon. There was only one thing to be done; I rebooked myself on the train that I’d previously rejected, and walked out the door of my hotel at 5:30am, muttering a few choice expletives at my own insanity. It is possible to pay cash for the bus, but that requires explaining your destination to a driver who probably won't speak any English; it is far simpler to use a T-Money card, which can be purchased at any train station. Once on board all the stops are announced in Korean only, though a display at the front switches to English intermittently. Those wanting to be sure of where they're going should sit on the right hand side of the bus, as the park comes into view from about two kilometers away. The route makes a detour away from the park moments before one would expect to arrive; stay on board for a further two stops to the one diagonally opposite from the park entrance. Today the park opened at 9:50am, an oddly precise yet accurate time as a subset of rides were ready to go as I made my way through the gate. I was a little disappointed to learn that the list did not include the new coaster, but an operator told me that it was due to start at 10:30am. Rather than wait around I decided to double back to the Ferris Wheel to get my overview shots out of the way before the weather closed in. The cars were enclosed, but each had a window large enough to reach through with a camera. I was back in front of Draken (#2422) ten minutes before the appointed time, where I found a small group forming in front of an impressively detailed model of a dragon complete with glowing red eye. 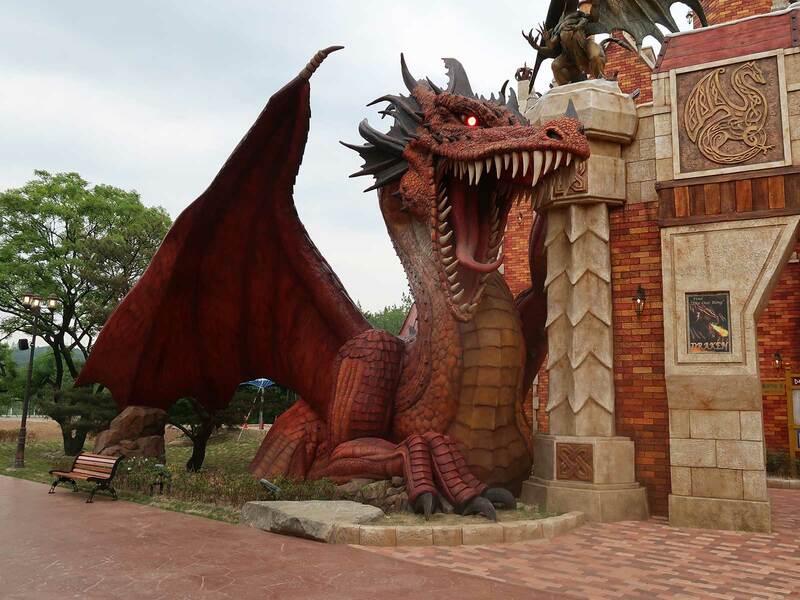 There was no sign of any activity taking place at the ride itself, but in due course a walkie-talkie chirped and a staff member ushered us towards the entrance, bowing every few seconds with almost animatronic precision. As the first people to arrive there was no need for us to go through the outdoor switchbacks; we were directed towards an ornate wood-panelled staircase leading to a castle-themed antechamber with enough room for four trainloads of guests. The ride operates with three row eight-across trains with traditional over-the-shoulder harnesses rather than the soft vest restraints found on more recent B&M installations, presumably for part commonality with the park’s other coaster. The operators allow exactly twenty-four guests into the station at a time, calling people forward as necessary to ensure that every seat is occupied. Waiting for specific seats is not permitted, and people are rearranged to keep groups together; I saw one couple being asked to give up their front seats in favour of a group of three. The system worked in my favour today; I ended up in the back left for my first lap, which is probably what I'd have chosen given a free choice, and I subsequently scored both edges of the front for rounds two and three, leaving me with no complaints whatsoever. The layout is essentially the same as Griffon with a few very minor tweaks to fit the park terrain. The second drop is sunk into a tunnel constructed within the car park, but otherwise the area around the ride has been thoroughly landscaped, with a walkway above the base of the first drop and a viewing area next to the splashdown element. The attention to detail is obvious, with a particular highlight being some elaborate artificial rock work wrapped around the base of the first Immelmann inversion. The experience is clearly old hat for most western coaster enthusiasts, as it’s fair to say that the larger Dive Machines are all very similar. That said, the normally reserved Koreans scream like there’s no tomorrow as the train slowly edges its way towards the first drop, and that's a lot of fun. Today the train was coming to an absolute stop in the mid course brake, maximising the tension at the cost of a little airtime, and while the enthusiast in me laments that slightly the locals were clearly delighted with the breather. On my second lap the one behind me swore dramatically in English before following up his imprecation with something in the local patois. The queue had built significantly by the end of my third lap, which I took as my cue to go explore the rest of the park. My first stop, made purely out of politeness, was Dragon 2 Loop Coaster, a non-looping powered ride from Zamperla that has recently been repainted into a dramatic mix of blue and pink. Today the experience was memorable chiefly for the cacophony made by the drive mechanism, though I can report that the ride quality was unaffected. All riders were given two enjoyable laps. The park has a portable fun house that looks like it may have operated on a fair circuit at one stage in its life. Unfortunately Maze was a disappointment today, as just about all of the effects were out of action, rendering the experience largely pointless. The only portion not visible from the midway was a colourful vortex tunnel with a thick layer of dust at its base serving as a very visual reminder of a system that had been out of action for years. My walk around the park eventually brought me to Phaethon, which I’d assumed to be closed given that I hadn’t seen a single dispatch. It wasn’t, but the operations today were appallingly inefficient, with the single functional train going out about once every fifteen minutes. I ended up waiting almost an hour despite the majority of guests being at the new coaster, and by the time I’d reached the front the rain had begun in earnest. I figured that I’d only get one lap in, and given that I selected back left, which was smooth, fast, thrilling, and somewhat painful as the weather took its toll. As things turned out I’d been on the last train; moments later an announcement was made in Korean and the queue emptied out. I decided to have a quick meal in the park restaurant on the off chance that things would clear, but it soon became evident that there would be no more coasters today. Rather than hang around I took the decision to leave in favour of an earlier train back to Seoul. My final departure time was 1:30pm, shortly after I’d have arrived had I not changed plans, and as the bus rolled away it was clear that I’d managed to dodge a bullet.